10 months and 2 weeks. Wow. Its been that long since the last time I posted. There were a lot of things going on and suddenly I just hadn't had enough time to write again. Not that I'm much of a writer. I just missed blogging all of sudden and impulsively logged in and wrote this post. I felt bad for abandoning this blog for such a long time and I just feel the urge to get back on it. I've been ignoring my blog for such a long time, because I have plenty things to do which leave me no time to write on my blog. I feel so guilty about it and that's why when I blogwalked and found that Ningrum Daud gave me this award, I was so surprised! Here's the rules of the award! 2. Let the nominated bloggers know that they have been nominated for this award. 3. Share 7 random facts about yourself. 4. Thank the blogger who has nominated you. 5. 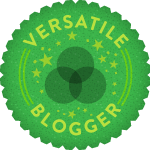 Add the Versatile Blogger Award to your post. Once again, I don't know how to express my gratitude except by saying: Thank you very much! You made me feel like I'm still a blogger even though I've been hiatus for quiet bit of time by now. 1. I love eating salak from bottom to top. 2. I can't eat roasted marshmallow without having white sticky marshmallow all over my mouth. 3. I think Eagle and Lion are very handsome! 4. I love sleeping on the recliner than on the bed. 5. When I don't like a book, I can just leave it unfinished in the middle, but when I like it, it only takes me few hours to finish the whole book. 6. Planning not to leave U.S. without getting to see and touch and play with snow. 7. I know a movie is a good movie when I don't fall asleep in the middle. Okay guys, now I need to go around and bring people good news (of having award xixixi)! Finally the first semester of the school ends. Jumped to the Winter Break and waiting for the Christmas to come! I am happy with the first semester, getting to know more people, not to mention, making friends. It was amazing! who am I? I am me. I live my life. Maybe I'm just ordinary girl, yet I have my special side cause God create everyone with their own speciality, and God never fail. wanna know me more? stay still. you dont? just leave. please be respectful and dont plagiarisming or spamming.